You’ve just bought your kids a new trampoline – best parents ever! While a trampoline is an exciting new addition to the backyard, you may find that after a couple of days bouncing, the kids don’t find it so ‘new’ anymore. Trampolining is a great way to keep the kids active and healthy, so in order to encourage them to continue using it, you may need to provide a little inspiration. Avoid the kids becoming tired of the trampoline by keeping them bouncing with these 4 awesome trampoline games. Before you play Poison Ball, make sure a safety net is properly installed around the trampoline. This game involves a lot of movement, so you don’t want to risk kids falling off and being injured. 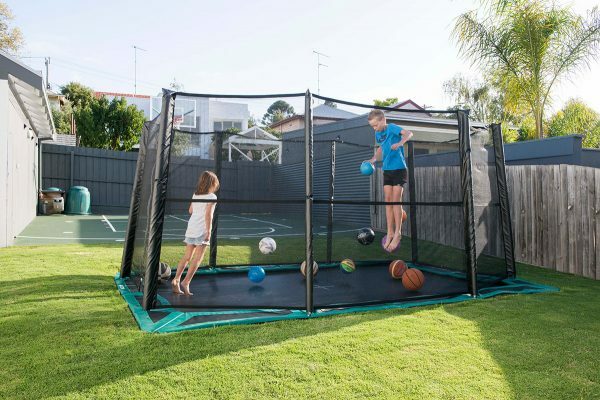 If your trampoline doesn’t already have a net, you can grab one easily from Oz Trampolines. All that is needed to play Poison Ball is a few participants and a few soft balls (if needed, soft balls can be purchased in our Games Pack). To play, place the balls on the trampoline and bounce around. Players must try to avoid being touched by one of the balls. When a player is hit, they must sit down. The last person who remains bouncing is the winner. The number of balls used will depend on the number of players and the size of the trampoline. Once you’re all set up, it’s time to have fun! Once again, make sure you’ve got the safety net with this one, as it can get a bit hectic. It’s also worth investing in pads for the trampoline to further enhance safety. To play Crack The Egg, one player must be chosen to be the egg. The ‘egg’ hugs their knees to their chest, lying in the centre of the trampoline. All other players start bouncing, trying to get the egg to ‘crack’. As they bounce, it will become more and more difficult for the person in the middle to hold their grip. The other players cannot touch the egg while they are bouncing, and the game ends when the egg cracks – the player lets go of their legs. While this game is great fun, it’s also important to supervise the kids while playing to make sure they’re not playing it dangerously – i.e. bouncing too close to the ‘egg’. Sleeping Soldier is a variation of the classic game marco polo. To begin, one person is chosen to be the ‘sleeping soldier’. This person sits in the middle of the trampoline with their eyes closed, counting to ten out loud. All other players must move quietly around the trampoline, avoiding the sleeping soldier. The sleeping soldier then calls “sleeping soldier wakes!” and, with their eyes still closed, begins crawling around the trampoline, trying to touch or tag the other players. The other players move around, trying to avoid being tagged. Once someone is touched, they also become a ‘sleeping soldier’, and must crawl around with their eyes closed. The last person not to be touched is the winner! This game can be played with blindfolds, or in the dark for dramatic effect. Bushell Bounce is great for training hand-eye coordination, and if you have kids that are competitive, it’s a good way of turning trampolining into a competition. Firstly, set up a bucket outside of the trampoline somewhere, and then challenge the kids to bounce an object (bouncy balls are ideal) off the trampoline and into the bucket. You can adjust the how far the bucket is placed away from the trampoline to increase difficulty. Or, if you set up the bucket just right, you could even encourage kids to come up with trick shots, adding longevity to the game. Alternatively, of course, you could get a basketball hoop accessory and then let the kids come up with the most interesting slam dunks. Every kid loves games. Plus, they are the perfect way to keep your child keen on the trampoline. Invite some of their friends over, teach them these games, and you’ll be guaranteed that they’ll never stop bouncing again. Check out our trampoline games guide for even more fun ways to use your trampoline. If you’re looking to upgrade your trampoline, or purchase any of our safety parts to guarantee your children’s’ safety, look no further than Oz Trampolines. Rated by parents as Australia’s best trampolines, you can’t go wrong. Learn more about our amazing range of trampolines today.